Our monitors are not as big as white boards, but we model our business processes on them and often need as much space as possible. To utilize the most space best thing would be if we had the entire screen area to work with and could hide all the “fluff”. Full-Screen mode is currently supported by Firefox, Chrome and Safari browsers. This new feature is currently in Designer master repo and will be part of the next release. This entry was posted on Friday, July 6th, 2012 at 6:13 pm and is filed under Uncategorized. You can follow any responses to this entry through the RSS 2.0 feed. You can leave a response, or trackback from your own site. Hi, I am a business analyst doing BPM projects since 2010. Our development team adopted so far the jBPM 3.x release and since then we never upgraded. I am very inclined to move everything to BPMN 2.0 and use the web designer to avoid the burden of dealing with Eclipse as the primary tool, that is OK for Java developers but too much for a BA working with a User, do you know what I mean? Looking into this doc (http://docs.jboss.org/jbpm/v5.1/userguide/ch10.html) i see “At this point, the designer does not yet support full roundtripping of your BPMN2 processes (due to limitations in the parser and the editor). We recommend you use the Eclipse plugin to add all the execution details (you can easily import a process from Guvnor there). The results can then be committed back to Guvnor so that the business user can see the resulting process. We are working hard to add full roundtripping support in the next version.” that very appeals to me. 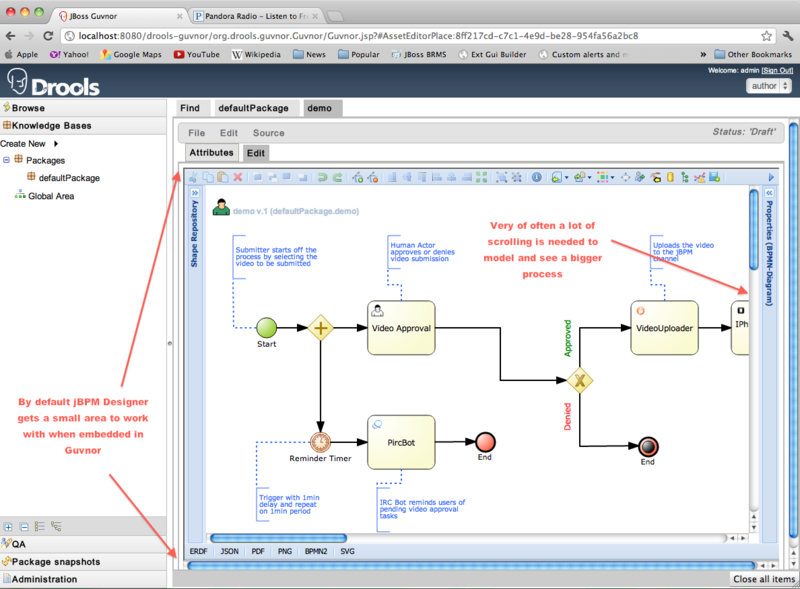 I would like to join my user that is sponsoring my project in an e-meeting and depict the process diagram outside Eclipse, for instance using the Web Designer. Then, once I get the user sign-off, hand-off the model into the development team, by the means of saving the model as an XML file, then allowing the developers import the model into Eclipse. How far I am for getting into that scenario? There are some differences however between the Eclipse editor and Designer such as Designer has visual support for Lanes, Text Annotations and Groups, but the Eclipse editor does not, so if you create your business process in Eclipse initially, you would have to add those nodes back in the Web Designer. 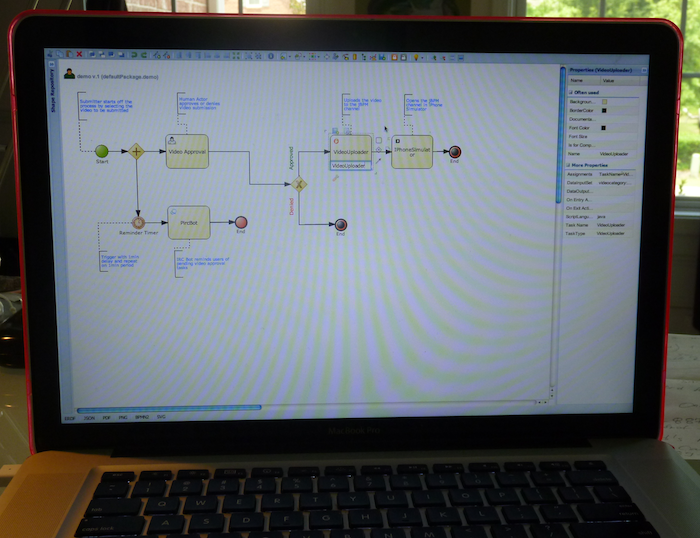 Other than that all supported BPMN2 elements should round-trip fine. I would recommend using the latest jBPM installer which comes with the latest Designer release. We are also going to release a new version o Designer hopefully within next couple of days which adds more features and bug fixes.